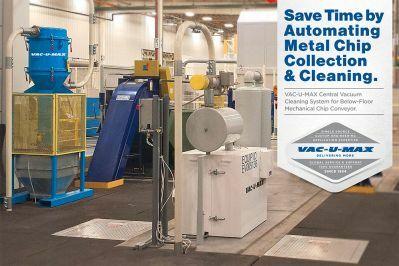 High-powered vacuum pumps and VAC-U-MAX's unique Tube Hopper are the key parts of a central cleaning system that collects and deposits metal chips onto below-floor mechanical chip conveyors. The system is used to manually clean the inside of the machine tool and large parts that are being machined which have a lot of nooks and crannies for chips and coolant to build up inside. The Tube Hopper discharges the collected chips onto the mechanical chip conveyor which runs beneath the floor level. The system is ideal for applications requiring the cleaning of all types of metal debris including cast iron, steel, aluminum and composite chips, wet or dry, and other abrasive materials with coolant. The unit offers mildew-resistant filters that provide clog-free collection of all chips that fit through the hose, reducing cleaning times and increasing uptime for expensive machine tools.